RadioShack's Philip Deignan and Jason McCartney will race for the American United Healthcare Pro Cycling team in the 2012 season. RadioShack and Leopard Trek merge for next season, leaving several riders and staff members scrambling to get a new employer. UnitedHealthcare also signs Jeff Louder (BMC), Ben Day (Kenda - 5-Hour Energy Cycling Team) and Jay Thomson (Bissell Cycling Team). Deignan is a reliable team worker with already six Grand Tours under his belt. He won't be adding new Grand Tours by joining an American Professional Continental team, but he expects high class racing. "I'm delighted to be joining Team UnitedHealthcare. I saw the Team race in Utah [Larry H. Miller Tour of Utah] and in Colorado [USA Pro Cycling Challenge] this year and the group of guys there was first class." Several strong riders who have raced the biggest races in Europe have already joined the outfit. Hilton Clarke is in the roster as well as multiple Giro d'Italia stage winner Robert Förster. "The level of support they [riders] received from the Team's staff; management and sponsors – especially UnitedHealthcare – really impressed me. After meeting with Mike [Tamayo] and the other team directors in Colorado and hearing their plans for the future, it was an easy decision for me." Deignan has also a high profile win with his 2009 Vuelta a España stage 18 win into Ávila. He was ninth that year. He was the first Irishman to win a stage in a Grand Tour since 1992. "I'm really excited about being part of this Team and I look forward to racing with my new teammates in 2012," Deignan concluded. The team is equally excited to have Deignan on board. "I am really looking forward to working with Philip. 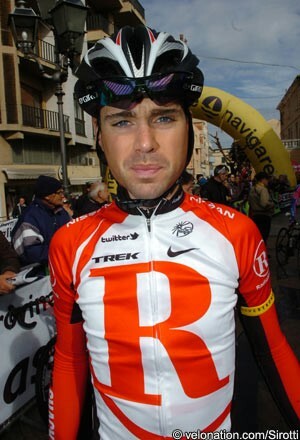 His ninth place finish at the Vuelta in 2009 shows his ability and level of depth," said Tamayo. "Here he will have opportunities to not only race, but he will be given the leash and climb with the best. We are ready to support him 100 percent and see what kind of great rides he delivers for us in the mountains." McCartney has also Grand Tour experience and, like Deignan, won a stage in the Vuelta a España (2007) and a very good time trialer. He was US National time trial Champion twice in his career and also a good climber. He won the mountains classification in the Tour de Georgia twice and once in the Tour of California (2009). For McCartney it is a return to the team that he rode for in 2004, before going to Discovery Channel, Saxo Bank and then RadioShack. "Early in his career, Jason rode for us and did well," Tamayo said. "He qualified for the 2004 Olympics by winning the Olympic Trials. From there he went on to ride for Discovery and RadioShack where he gained six to seven solid years of Pro Tour experience." This experience will come in handy for the ambitious UnitedHealthcare program. "He has tremendous horsepower and strength, and has the proven ability to ride for two men like he did with his previous team. That's one of his many strong suits and we're looking forward to having him back on our Team," Tamayo said. Other riders to join are Jeff Louder of the BMC team, who has a few solid European Years behind him. Louder is also a returning rider, having left the United States in 2008. He rode for Health Net presented by Maxxis in 2006 and 2007. Australian Ben Day has already raced for several teams in different countries, including Poland, Portugal, Belgium, the USA and Australia. After two seasons with Fly V Australia, he joined the Kenda team. Day was Australian time trial Champion in 2003, won the Tour de Beauce in 2007 and 2010 and was fifth in the 2005 Tour of Britain. He also rode the Chrono des Herbiers several times, with his best result a sixth place in 2004. He was also third in the 2008 Herald Sun Tour. South African Jay Thomson has been African time trial Champion in 2008 and 2009 and also won the Tour d'Eqypte (2008).